Important: Always resuspend nanoparticles in fresh Capture Solution prior to adding DNA sample. The amount of nanoparticles needed for efficient DNA separation depends on the DNA quantity in the starting sample. 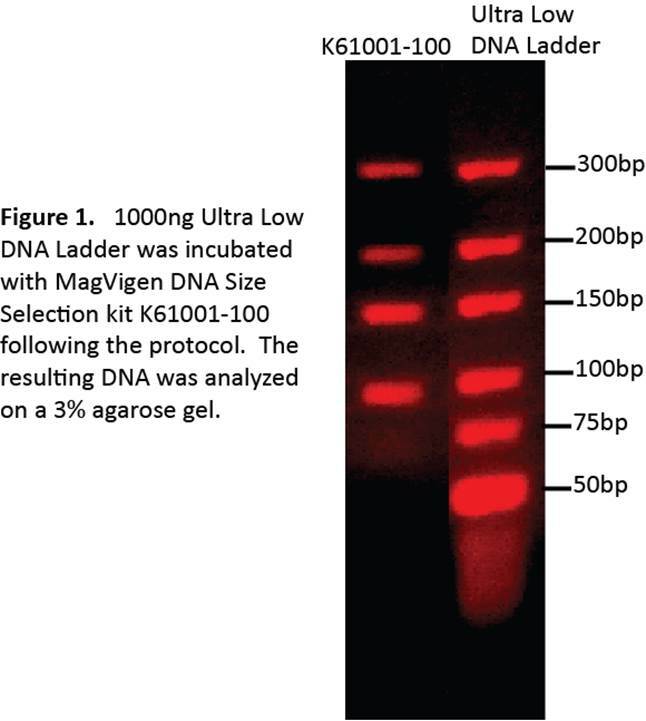 Example: If the DNA-containing sample has no more than 1000ng DNA, then use 40μl (80μg) of MagVigen™ DNA Select nanoparticles for capture. Scale up accordingly if DNA quantity or sample volume increases. Remove MagVigen™ DNA Select nanoparticles from storage and bring them to room temperature. Remove 40μl MagVigen™ DNA Select nanoparticles and put into a clean 1.5ml reaction tube. Collect MagVigen™ DNA Select nanoparticles using magnet and remove the supernatant. For every 20μl DNA sample, resuspend the nanoparticles in 60μl Capture Solution 100. Note: A volume ratio of 1:3 for DNA : Capture Solution must be followed in order to separate DNA>=100bp. Add DNA sample to MagVigen™ DNA Select nanoparticles. Incubate the MagVigen™ DNA Select nanoparticles-DNA reaction at room temperature for 30 minutes. Keeping the magnet in place, wash the DNA-captured nanoparticle pellet by adding 100μl freshly prepared 70% ethanol. Let stand for 2 minutes. Remove and discard the ethanol. Repeat steps 11-12, performing a total of two washes. Allow the sample to air dry at room temperature for 5 minutes. Note: Do not allow pellet to over-dry and crack. This could affect the recovery.